Just need an expert opinion.. Are these plugs done or can go further? Seems like they got expired almost a decade ago..
And the carbon on the plug is also showing that your engine needs a tuning. Is your sonica turbo or non turbo? Second is this 10 w 30 full synthetic or semi one? was this a sarcastic comment? Are you drunk? do you think a turbo + 7 speed tiptronic keyless car can be purchase in between 550-650????? Dont look here and there, straight forward go for liqui-moly and your engine issues will be solve automatically. Its easily available.. Seems like this is a breaking news for you..
Opz.. My bad.. Next time will be carefull.. So my sonica's engine check light turned on, i got the car scanned and it turned out to be the oxygen sensor that is faulty. Can anyone suggest from where can i get a new oxygen sensor?? The mechanic is giving me a used oxygen sensor for about 5k. 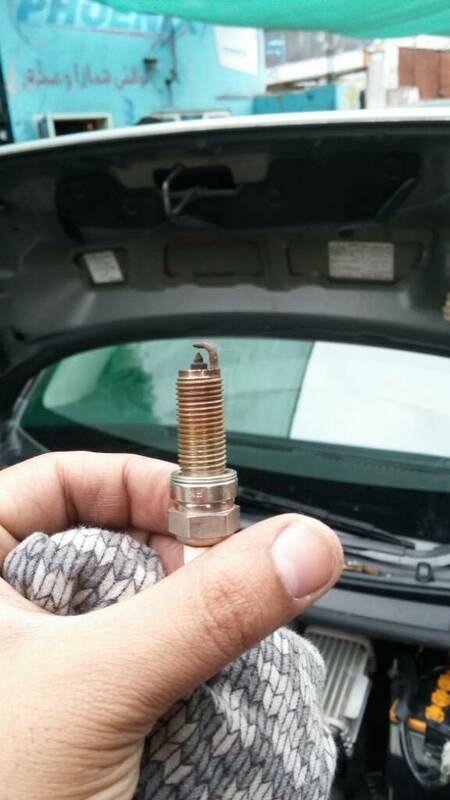 So i have been driving the car with the engine check light one ever since i made the post. The car seems to be absolutely fine without any issues. Brother where did u buy the replacement pump from? And how much? Was sound more at idle or all rpms??? the mechanic arranged the pump for me. total expense including labor was around 5k or 6k. used one should not cost more than 2-3K. Listen there are 2 types of Sonica, one is simple the other one is tiptronic so i am talking about tiptronic version. I have posted about engine oil and the problem which I have faced about 6months ago. Now the problem is solved when i started using Mobil1 0W-40. What an awesome oil. Although expensive about 1500Rs/L, but really worth its price. Secondly i just changed my transmission oil from Toyota GT motors and they said that its type is CVT TC. i am a bit suspicious is that correct?